It’s finally here! The spring anime season has finally begun and in one day we get two of this seasons heavy hitters: Attack on Titan Season 2 and My Hero Academia Season 2. So, instead of writing separate impression pieces for both, I’m going to do a double feature. I’ll lay all my thoughts out for each without separating them into different segments to not make this longer than it has to be. 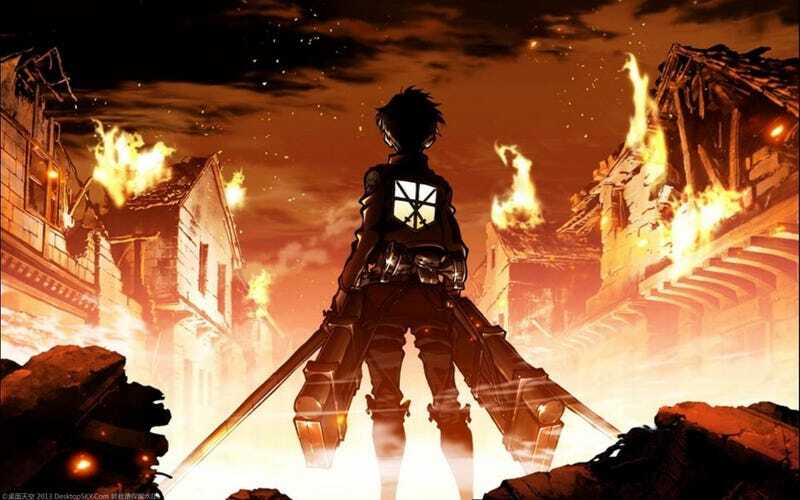 We’ll start with Attack on Titan. It’s been 4 years since the first season of Attack on Titan aired in 2013, and now we’re finally getting the next installment. The current run for this season is set at 12 episodes, shorter than the previous seasons 24 episodes, so to not waste time this episode jumps straight into the action. In 20 minutes in reminded me exactly why I love this show: It’s dark and brutal. Granted, that mostly applies to just the last few minutes before the credits roll because it’s pretty calm otherwise, but those 5 minutes are enough to bring back memories from the first episode of the previous season. That feeling of uneasiness and discomfort as Titans devour people. That discomfort, I believe, is amplified by just how good this show looks. It looks better than the first season at its animation and art peak, probably due to the lower episode count, though the trailers have indicated that it will look even more spectacular when we get into the real meat of the season. Lessons learned from Kabaneri of the Iron Fortress are apparent here, making it definitely stand out from the previous season. And if you’re wondering if the opening for this season is as good as Guren no Yumiya from the first season? It’s 50/50. On one hand it has a similar vibe to it, but I don’t see myself singing along to it because it isn’t quite as bombastic. It isn’t bad, just that at this point I feel like they’ll never create another opening that can stand up to that one for sheer impact. Otherwise the soundtrack sounds about the same as it did before, same goes for sound effects and the voice cast. In other words, you can jump right in and feel like you never left. Unlike Attack on Titan, it only took a year for My Hero Academia to get a second season. The best part? This one is double the length of the previous season, going from 13 episodes to 25. Similar to Attack on Titan however, is that My Hero Academia also doesn’t waste any time reminding you why you fell in love with this series. That feeling of wanting to run, to protect, to fight, and be a hero. The episode starts off with a powerful scene that makes a bold statement about the direction this story intends to take, and that what we’re seeing now is the road to those events. The soundtrack is just as heavy as it was a year ago, getting my adrenaline flowing and making me bounce up and down in my chair. I also watched this one dubbed because I think the dub is just fantastic. Considering I don’t there were any cast changes on the Japanese side it’s probably just as good as it was before, so if dubs aren’t your thing I highly doubt you have anything to be worried about. The only thing that bugged me in the audio department is that some of the lines felt.... tinny, like they hadn’t been cleaned up or recorded properly. It’s really only in one of the opening segments, just like how Shiki’s dubs first episode had a similar tinny effect to some lines early in the episode before it smoothed out towards the back half and then never happened again. The opening is also pretty decent as is the ending theme. Perhaps not quite as memorable as the original opening(this again? ), but still pretty good and definitely something I’ll probably listen to on its own. This spring is off to a great start as far as I’m concerned and while I still have some winter shows to finish up(Masamune-kun’s Revenge, Scum’s Wish) and one fall show(Gundam: Iron-Blooded Orphans), I plan to keep up with this season and not let anything fall behind. Iron-Blooded Orphans will conclude today so I plan to have a review up of the entirety of IBO within the day or the next two days.